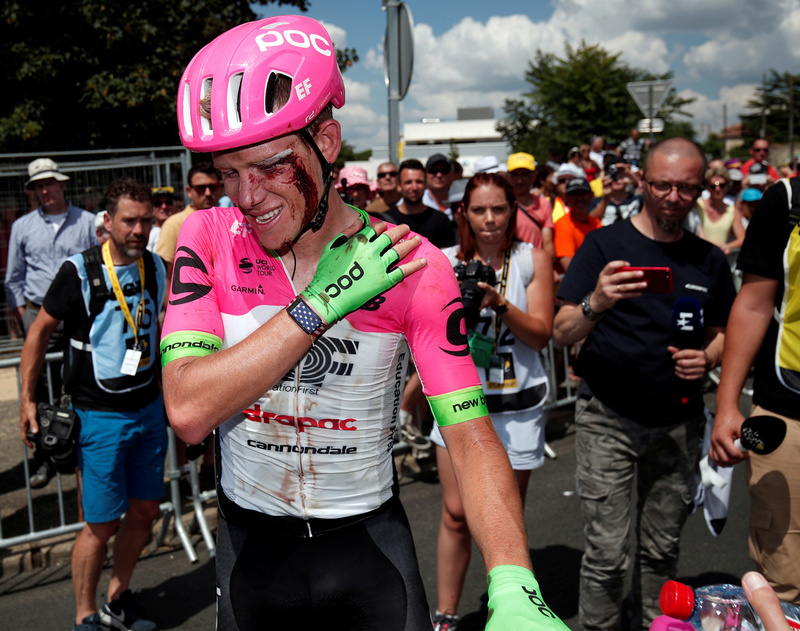 Lawson Craddock's Amazing Last-Place Finish In The Tour De France It was "incredibly emotional" to finish in Paris, the U.S. cyclist said. After fracturing his shoulder blade three weeks ago, he said, "I was raised tougher than that, raised in Texas." 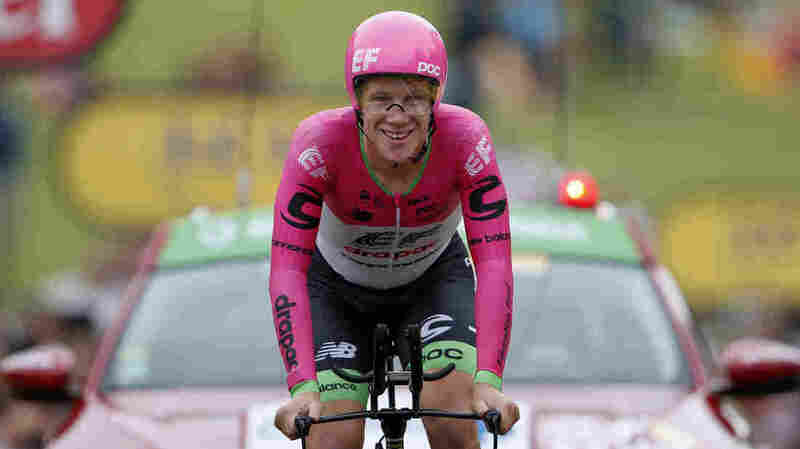 Lawson Craddock is seen finishing the individual time trial on Saturday, assuring his ability to finish the Tour de France in Paris on the next day. "It's been an incredibly testing three weeks," Craddock said via his team's website. "I've pushed myself well beyond my limits. There were many times during the race that I wasn't sure if I could make it, but the encouragement and generosity the whole world has shown me motivated me every step of the way. To reach the finish line in Paris has been incredibly emotional." Craddock finished last, and won thousands of new admirers by finishing at all. He fractured his scapula on July 7, the victim of a hard crash triggered by a skittering water bottle. He also had a gash along his right eyebrow that required stitches to close. After he was examined that day, Craddock gamely talked with reporters and said he would see how he felt sitting on his bike the next morning – but then his voice trailed off, as the emotion of possibly withdrawing, seeing his hard work and training undone by a water bottle, overcame him. Afterward, he said he'd keep riding to support his home track back in Houston. "I didn't really want to just give up immediately," Craddock later told Houston Public Media's Florian Martin. "I was raised tougher than that, raised in Texas. We're born fighters." Craddock is the first American to win the "Lanterne Rouge" – named for the red light on a train's caboose — that designates the Tour de France's last rider. In what's believed to be a new record, he held the title for the entire race. The 26-year-old cyclist decided to continue after doctors said it would be safe — but painful — to do so. He's been treated along the way, getting chiropractic sessions three times a day and aided along by medics and his fellow riders on the EF Education First – Drapac team. After he was hurt, Craddock pledged to donate $100 for each stage he finished to help the outdoor velodrome in Houston where he got his start in cycling. The concrete velodrome was almost entirely covered with floodwaters from Hurricane Harvey last year, making new cracks appear. As Craddock kept riding in France, others joined to support the track in Texas — and the campaign raised more than $225,000. Lawson Craddock suffered a bad crash at the start of the Tour de France — and finished, despite having a fractured shoulder blade. He also raised money for his hometown's velodrome in Texas. On the back of his Tour jersey, Craddock followed racing tradition by pinning his No. 13 race number upside down – hoping to flip any purported bad luck. In the same way, he's now turned a challenging injury into an inspiring accomplishment. Craddock's mother, Ellen, has acknowledged being worried about her son's health and safety in France. Speaking with HPM's Martin at the Alkek Velodrome in Houston, she said, "the team doctors were behind him, said the fracture was stable, and he wanted to do it. And then to have this purpose behind it was — we were all in." Craddock has ridden nearly all of the Tour's 2,082 miles with his injury. That includes 26 climbs up mountains or hills. After one stage that was built around 13.5 miles of infamously bumpy and slippery cobblestones, Craddock tweeted, "Suffering like I've never suffered before." He said he would double his donation to the velodrome for that day. The Tour de France sweeps the slowest riders out of the race, if they fall too far outside of each day's stage-winning time. For 21 stages, Craddock stubbornly made the cut – something 31 of the 176 riders who started the 2018 Tour were unable to do, because they either withdrew or were sent home by race officials. Equal parts heartwarming and heartbreaking. He rode at the back of the peloton, often trailed only by his team car and the red car that carries Tour officials monitoring the race. He was urged on by teammates, by fans along the roadside, and by the 3,000 people who have donated to help improve his home track. On Twitter, fans followed the #CraddockWatch hashtag. Craddock finished 145th – more than four and a half hours behind the winner, Geraint Thomas. Thomas knows something about what Craddock has been through: In 2014, Thomas crashed badly on the Tour's first day, fracturing his pelvis. He stayed in the race, and finished 140th. On Monday, Craddock thanked his supporters for their help, posting an image of himself holding a can from Karbach Brewing in Houston. The tweet ended, "Time for a beer."